In this series of blog posts, I have been talking about how to see what types of Form Errors your website visitors are receiving so you can improve conversion. So far, we have learned how to see how many Form Errors your website is getting, which fields are causing those and how many Form Errors you get per Form and Visit. As my regular readers know, I like to go beyond the basics, so now we are going to kick it up a notch and get into some real fun stuff. Fasten your seat belts! Which Fields on Which Forms? 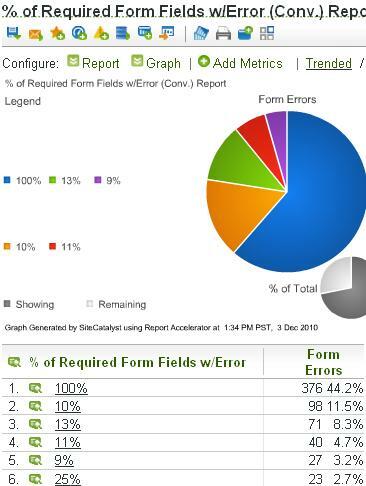 Using this report, we can see that for the first form shown above, 66% of the times visitors get a Form Error, they had eight form field errors (or left them blank). This data, when coupled with observational data using a tool like ClickTale can be invaluable in driving increased form conversions! What % of Required Form Fields Have Errors? While the above report, which shows Form Field Errors by Form, is powerful, one question it doesn’t answer is: How many of the required fields on my forms are not being filled out by users? The answer to this question can help you figure out which fields should/shouldn’t be required. So to answer this question, what you want to do is to look at each form that loads on your website and calculate how many fields the user received an error for and then divide that number by the total number of required form fields. For example, if you have a form with eight required fields, and the current user received two errors on that form, the calculation would be 2/8 or 25%. You should then pass this 25% value to an eVar when you are setting the Form Errors Success Event. Once you do this for all forms, you will have a report that looks like the one shown here. Using this report we can see that the highest number of Form Errors are cases where users are getting errors on every field (which is most likely people leaving all fields blank). Maybe our users don’t realize that these fields are required and we can do some testing to create a better experience or reduce the number of required fields? Finally, if you are doing a good job of grouping your website forms using SAINT Classifications, you can see some super-cool reports. In the following report, I have grouped all of my website forms into high-level buckets of Demo and Free Trial. 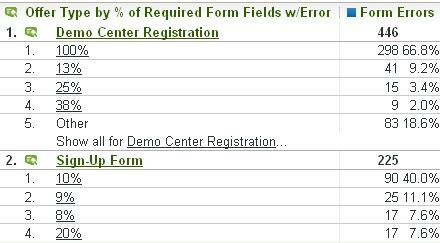 Then I broke this report down by the percentage of required fields that result in Form Errors. You can see here that most website visitors on Demo forms are getting errors for 100% of the fields (probably leaving them blank! ), while for the Free Trial, the largest percentage of required fields with errors is 10%. Interesting data indeed! In this post, we have covered some advanced ways to see which fields produce errors on each form, see this by form and seen how to know which forms have the highest total required field error rates. These reports can provide an enormous amount of insight into what is happening on your forms with respect to errors and once you understand your visitor’s form behavior, you can apply these learnings to all forms on your site. In my next post, I will cover a tangentially related item (related to Forms, but not as much about Form Errors) that I think is super-cool. When would you recommend tracking form errors? Only on form submit (that would loose all data for users giving up filling out the form)? Each time a field is exited / looses focus (that would potentially generate a lot of server calls)?